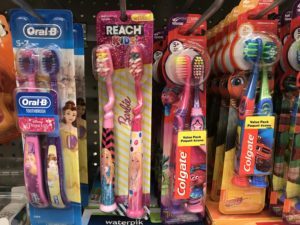 How do you decide on a toothbrush? There are so many choices! Toothbrushes typically have age recommendations listed on the packaging. You’ll see in these photos there are brushes recommended for different ages, from toddlers to 7+ year olds. Soft toothbrushes are always better for kids. If you have questions, talk with your dentist about a toothbrush recommendation for your child. Notice the age recommendations on the toothbrush packages. For real – my son’s toothbrush. How did I miss this? It’s in the garbage now. 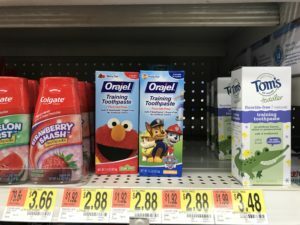 Which toothpaste is right for your child? Toothpastes are also packaged with age recommendations clearly listed. Oftentimes, no toothpaste is suggested to parents just beginning to brush their baby’s teeth. Training toothpastes are usually fluoride-free and safe to swallow. Training toothpaste is a great idea for little ones, especially babies and toddlers. As your child becomes better at brushing and spitting, a toothpaste with fluoride is recommended by age 4. 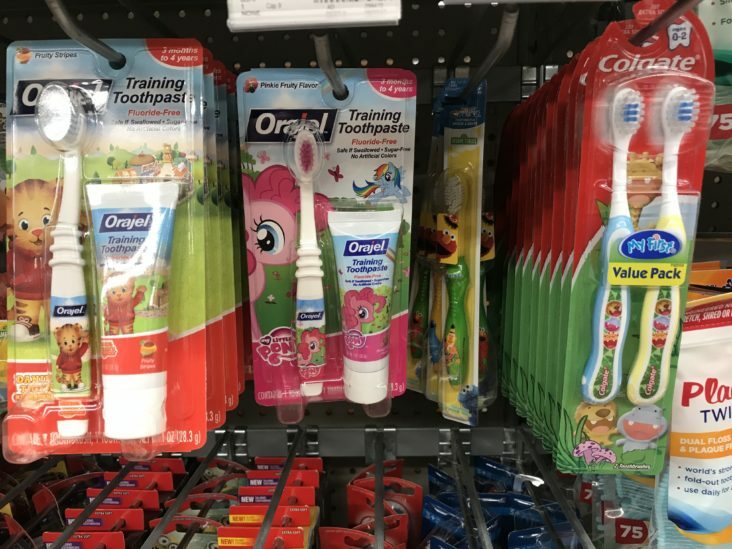 Training toothpaste options available at your local retail store. 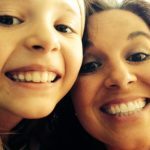 When should I start flossing my child’s teeth? Right away. Flossing is also highly recommended by dentists for children as their teeth start to fill in. Getting kids used to flossing at 3 or 4 years of age is ideal. 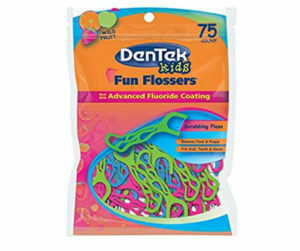 Disposable flossers can be purchased in fun shapes for kids. Flossing with a flosser makes the job much easier for little ones with unpracticed fingers. Don’t expect your 4 year old to be able to handle a string of floss. Start with the flossers and establish good habits. The rest will come in time. Mouthwash is fun! As your little one progresses with his or her oral care and can brush their teeth without swallowing the toothpaste, adding mouthwash into their tooth brushing routine is a fun treat. Mouthwashes for children are always alcohol free and almost always contain fluoride. When selecting a mouthwash, I’d recommend you keep in mind the flavor of toothpaste and purchase a complimentary flavored mouthwash. There are lots fun flavors available. 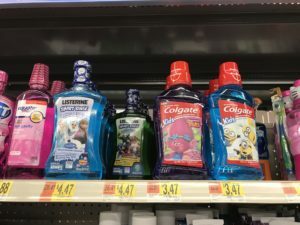 My kids loved picking out a new mouthwash at Walmart or Target. Hey, if they were excited about mouthwash, I was one happy mom! Mouthwash comes in lots of fun colors and flavors. There are many ways you can make it fun for kids to take care of their teeth. Teach them to fight tooth decay right away. Good brushing habits established at early ages make for positive, lifelong brushing habits. Flossing early on helps combat tooth decay between teeth. Mouthwash provides a fluoride rinse and also helps strengthen and protect teeth. Give your kids all the skills and tools they need to maintain healthy, beautiful smiles from their first tooth all the way through adulthood. A healthy smile is a happy smile!